Tom Brady press conference: Ball denial. New England Patriots quarterback Tom Brady took nearly 30 minutes of aggressive questions about football pressure from reporters this afternoon in the latest surreal episode of the Ballghazi scandal that is currently gripping (get it?) a nation in turmoil. Brady said that he selected the footballs he wished to use before they were presented to an official for approval ahead of Sunday’s AFC championship game and that he did not deflate them after they were OK’d. “I didn’t alter the ball in any way,” Brady said, adding that he’s also not aware of any other ball-deflation “wrongdoing” by Patriots employees. He attested that though he prefers balls inflated to 12.5 pounds per square inch of pressure (the lower end of the limit allowed by the NFL), he didn’t notice that Sunday’s footballs were particularly soft (or that they were harder in the second half—it’s been reported that they were reinflated at halftime)*. 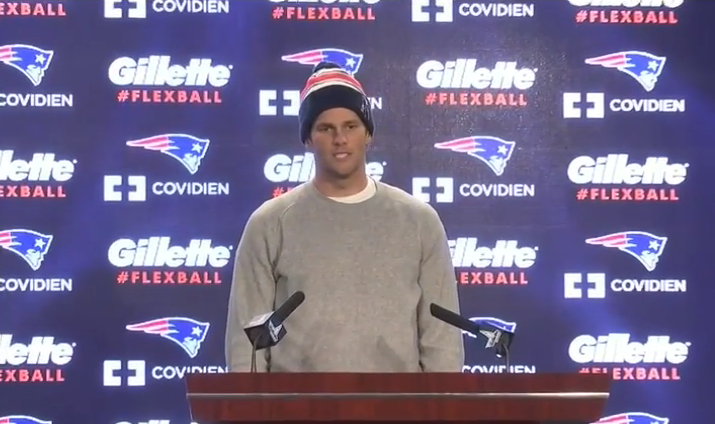 The press conference took place in front of a backdrop advertising Gillette’s FlexBall razor. Correction, Jan. 22, 2015: This post originally described underinflated balls as lighter than properly inflated balls. While this is technically true, the balls likely wouldn’t feel lighter if underinflated since air doesn’t weigh that much.